The new edition continues to be a reliable and practical guide, and serves as your quickest reference to the substantive law in this area. Gain critical insights on the current status of the Canadian Bankruptcy and Insolvency Act from legal expert, Frank Bennett. For more than 20 years, Bennett on Bankruptcy has been a reliable and practical guide, and serves as your quickest reference to the substantive law in this area. 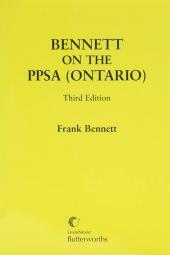 Frank Bennett provides you with explanatory notes to point out many of the leading cases on a particular section or rule. The case references are helpful as they give you background in the particular area and the legal principles involved. 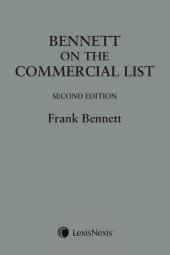 Frank Bennett, L.S.M., LL.M., specializes in bankruptcy, receivership and insolvency law and is the founder of the Toronto firm Bennett & Company, Bankruptcy Bankruptcy Law. He is the past Chair of the provincial and national Bankruptcy and Insolvency sections of the CBA, a former member of the Bankruptcy and Insolvency Advisory Committee to Industry Canada, and a lecturer. 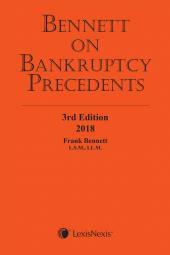 He writes frequently on the subjects of creditors' and debtors' rights and remedies, receivership and bankruptcy, and is the author of Bennett on Bankruptcy Precedents, 3rd Edition, 2018, Bennett on Bankruptcy 21st Edition, 2019, Bennett on the Commercial List, Second Edition, 2015 and Bennett on the PPSA (Ontario), Third Edition, all published by LexisNexis Canada Inc.